I am posting this today, almost one year later than I promised čika Idris that I would disseminate online the Hujdurović brothers’s Open Letters to the Citizens of Bosnia-Herzegovina. Today it’s 21 years since the day that Srebrenica fell, and the day when we commemorate genocide in Srebrenica and in Bosnia. People sometimes speak about lessons from the past, but we don’t learn lessons from the past by merely engaging in commemorative practices, symbolic per nature, and, in the case of Bosnia-Herzegovina, highly politicised and for that reason prone to abuse by nationalists who thrive on keeping people stuck in a past of extreme violence, and here I mean both Serb and Bosniak nationalists. I have been to Srebrenica a number of times, including three times for the Annual Commemoration and collective burial in Potočari. Of everything good and bad that I’ve observed there, one image always stands out in my mind: that of a little girl with a t-shirt saying ‘Lucky Girl’. 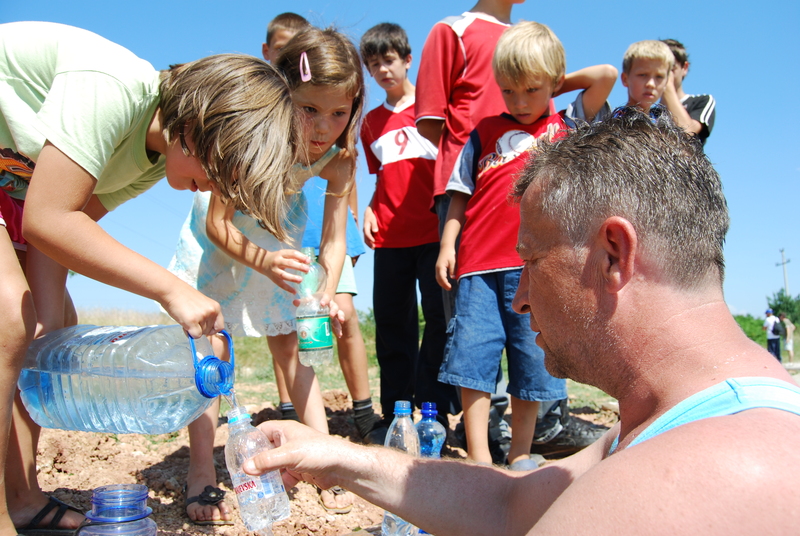 At the time I wrote: “The beautiful girl, and all the other children I got the chance to meet in my trips around former Yugoslavia are what gives my work a purpose. She means that the past is important, but that it is the future that really matters.” Well, the girl is now 14, and her future has been systematically undermined by nationalists, some of whom killed her family, while others thrive on her family’s victimhood. With her in my mind, and many other young people that I met during the last 10 years, I would like to to invite the readers to learn about the case of two brothers who, having repeatedly lived through experiences of extreme violence, never became hostage of the traumatic past, but instead continued to live in the present and work for a better future, not only for themselves, but for all, as the natural way to remain truthful to the legacy of courage and decency of their beloved father. What follows is a short introduction to the lives and work of Idris and Meho Hujdurović, partisan veterans from Bijeljina, and to their present engagement in favour of a better future for the people of Bosnia-Herzegovina. On a separate page, I am also publishing their Open Letters to the Citizens of Bosnia-Herzegovina, only in Bosnian/Croatian/Serbian. I met Idris Hujdurović in 2014 when I was living in Bijeljina, a town in the North-East of Bosnia-Herzegovina, now part of Republika Srpska. As part of my fieldwork for the PhD, I was looking for people who would be willing to talk to me about the transformation of Bijeljina through time and how they were personally involved in it. Idris Hujdurović, a civil engineer, founder and director, for almost thirty years, of the construction company GIK-Rad, had, literally, built much of Bijeljina: all of its schools; the tribunal; all the communist era apartment blocks; etc. What immediately fascinated me, was not, however, his professional record, of which he didn’t speak much. It was the compelling, yet tranquil way he spoke about his life, which revealed a man who, having lived through so much, lived in the present, and focused on the future much more than on the past. After the interview, as we walked home through the neighbourhood of Ledince, where we both lived, he said it would be nice to meet again for a coffee, given that, we had just realised, we happened to be neighbours. One week later, when we met again, čika Idris gave me a letter (link), that he and his brother Meho, who lives in Tuzla, wrote in April/May 2014, and sent to all political institutions in Bosnia/Herzegovina, both at state and entity levels. Directed to the citizens of Bosnia-Herzegovina and to the politicians competing in the upcoming general elections (which took place in October 2014), the significance of this open letter emerges in the context of a life of active engagement for the common good, guided my the example of courage and dignity of their late father. Born in 1925 in Bijeljina, to a family of land-owners and craftsmen, Idris Hujdurović grew up in a loving environment. While most Muslim families at the time privileged religious education and traditional crafts, the Hujdurović family greatly valued modern education, without disregard for their Islamic practises and traditions. Idris’ father, Mujo, made sure his children received formal, secular education. His sons attended the gymnasium, and were expected to later go to university. He wouldn’t lived to see that, though. Mujo Hujdurović was killed by the ustasha regime in Brčko in early 1944. Just before Yugoslavia entered the Second World War, Mujo Hujdurović and his sons had built a secret shelter, where an unknown number of people, Serbs, Jews, communists or partisan sympathisers, went into hiding. When ustasha guards found the place, Mujo Hujdurović and Idris, then eighteen years old, were arrested on the spot and taken to a detention site in Brčko. On that night, with the help of other prisoners, Idris managed to escape from a tiny window; his father was executed the next day. Idris then joined the partisans, and participated in the NOB (narodnaoslobodilačka borba), the national liberation war of Yugoslavia. As a member of the partisans, Idris was initially assigned the function of bombaš (bomber): his task was to run towards enemy positions and throw a grenade. Not many bombaši survived such tasks. In recognition for his courage, he was invited to join the Communist party, regardless of the fact that he was a practicing Muslim. After the war, Idris pursued his studies in Belgrade, and became a civil engineer, as his father wanted; in the meantime, his brother Meho, who had also joined the partisans, studied Agronomy in Zagreb. Both returned to Bijeljina, where their mother and sisters still lived, and became important agents of the post-war development of Semberija. Idris Hujdurović found a place for himself in the communist regime, through which his energy and creativity was channeled, but he always managed to preserve his own autonomy within it. He did pay, however, a high price for the sincerity of his commitment. In 1952 he was arrested and sent to Goli Otok, where he remained until 1955. He did not side with the stalinists, but was denounced on the basis of a casual conversation in which he questioned the wisdom of entering in conflict with the Soviet Union, by saying that it wasn’t clear to him why such a conflict was necessary. He survived Goli Otok and eventually returned home to Bijeljina, and was reinstated as director of GIK-Rad, the construction company he had founded in 1948. He left his post only in 1976, pushed into early retirement, after he successfully opposed plans to refurbish the town’s centre, which included the demolition of the Atik Mosque. Even as Yugoslavia entered a stage of social and political decline after Tito’s death, until the disintegration of the state that Idris Hujdurović had helped create, despite his own experience of persecution by the regime, he remained committed to the partisan legacy. As for Meho Hujdurović, he became the director of Semberia’s agronomical station, where he developed new species of vegetables, including a species of cabbage that became one of the main products in the region. He also educated and provided support to local farmers to develop horticulture so as to better explore the potential of the land and diminish the regional dependency on cereal production. His personal contribution to the quality of life of the peasants of Semberija cannot be overstated. When war returned to Bosnia-Herzegovina in 1992, the Hujdurović family suffered again. Bijeljina became dominated by a climate of terror, where Bosniaks were systematically intimidated. Nationalism and greed went hand in hand, and wealthier, educated individuals were particularly at risk. Both brothers were forced to give up on their homes and other property; Meho was deported to Tuzla, and Idris was briefly arrested, then released thanks to the mobilisation of friends, after which he was forced to flee with his wife across the border to Serbia, and eventually into exile. Idris Hujdurović returned to Bijeljina in 2004, now a widower. Already in his seventies, he actively engaged in the process of return of Bosniaks, as a member of the local association for sustainable return (Udruzenje povratak i opstanak), then led by the late Salem Čorbo. He is also a renowned bee keeper, who has developed a number of natural remedies based on honey, which he shares at no cost with anyone in need; and a farmer, who, now entering in his nineties, still maintains the large family orchard. In the aftermath of the popular protests that, if only for a moment, shook Bosnia-Herzegovina in early 2014, Idris and Meho felt compelled to give their contribution to the quest of a a better future for their country. Their principles, life experience and education converged with the particular insights each one of them gained from living, in Meho’s case, in Tuzla, the epicentre of the revolt, part of the Federation (one of Bosnia’s entities); and Bijeljina, the second city of Republika Srpska (the other entity), where a small locally-organised protest was immediately ‘dealt with’ by thugs from the local football club, and later by the police through ‘informative conversations’. Although they were not directly in touch with participants in the plenum process, they grasped the essential of its dynamics. Their open letter endorsed some of the plenum ideas and demands, but without the elements of populism that did much to alienate potential supporters, such as unrealistic demands with financial (spending) implications (as I witnessed myself in Sarajevo, and which were very likely part of the efforts by infiltrated agents to discredit the plena), nor any hint of the ‘yugonostalgia’ which inspired a number of plenum participants. Assessing the political and social situation in Bosnia as critical, they called the citizens to involve themselves in the creation of plenum-like local forums, but rather than placing their faith in the mysterious mechanisms of direct democracy, which made the plena prone to infiltration and infighting, they invoked the responsibility of public intellectuals and other educated, respected figures to step up and assume task of organising and leading. Without demonising the political class, they listed a series of concrete, realistic measures, cutting on public administration and political privileges, and set specific goals to their realisation, which would result in financial savings to be reinvested in the productive sectors. Against those goals, the plenum-type assemblies should assess politicians’ work and monitor the (non)implementation of their electoral promises. Idris and Meho Hujdurović sent this letter to all the media, which ignored them. Lacking the skills necessary to engage with the internet, they were not able to get in touch with the generation of political activists that seemed to be emerging from the ashes of the plenum process. In May 2015, one year after the initial letter, and five months after the general elections, the Hujdurović brothers wrote a new letter, an exercise that most would consider futile, but which they felt to be both a duty and a right, as citizens, to interpelate power as well as their fellow citizens. Based on a lucid assessment of the post-election situation, the letter expands the set of proposals, to include a number of ideas for social and economic reform, so as to have a fairer distribution of jobs and revenue among the population, incentivise agricultural production and other sustainable activities The letter renews their appeal to the intellectual class to assume the role that should be theirs, but is especially directed at the younger generations, whom it exhorts to take action. Again, they were ignored. In the meantime, I had moved out of Bijeljina, and when I come back for a visit in the Summer of 2015, čika Idris gave me the second letter, and asked me to post it online. I am sorry that only now I have found the urge to do it, caught as I was with ‘my own stuff’. When I left Bijeljina for the second time in mid-September I was feeling discouraged about the social situation in Bosnia-Herzegovina as I had never felt since I became interested in this country. Without meaning to whine about it, it took me many weeks before I was able to do any work at all for my thesis, because the sense of possibility that the Hujdurović brothers action convey was completely absent from my horizon. All I could see around me during my field visit was people who wanted to leave the country, not only because they lacked economic opportunities, but because they were exhausted of engaging with a system so morally corrupt that leaves (almost) nobody untainted. In this context, the letters stand out even more, as an example of the future-oriented commitment towards society of two elderly men who, through the good and the bad, have preserved their sense of agency, and mobilised the best of their knowledge and energy whenever they felt they could make a difference, and even when they knew that making a difference was an unlikely outcome. a mi se okrenimo našim današnjim životnim problemima. and turn ourselves to the problems of our present life. Na kraju, osjećamo potrebu da se i predstavimo, kao autori ove analize o situaciji u BiH (…). Sinovi smo oca Muje Hujdurovića kojeg su na najgori način (iako je bio musliman), ubile fašističke vlasti u II svjetskom ratu zato što je, s nama kao djecom, štitio i branio od tadašnjih fašističkih vlasti, komšije iz čitave Semberije, pravoslavce, Jevreje i sve druge ugrožene; što je jedan od organizatora pisanja rezolucije muslimana Bijeljine i Janje i Ugljevika iz decembra 1941. godine gdje su muslimani zahtijevali suživot građana svih vjera i da vlast štiti sve građane itd; što je imao niz ličnih istupa protiv tadašnje fašističke vlasti u učinio niz humanitarnih poteza za spašavanje ugroženih građana svih vjera. Vođeni tim idejama i ljudskim postupcima našeg oca u kritičkim vremenima II svjetskog rata osjećali smo obavezu da ovo napišemo i damo u javnost te uputimo vlastima, bez obzira kako će to ko cijeniti, a u nadi da će sve iznijeto prihvatiti prvenstveno stranake na vlasti, u cilju rješavanja problema gladnih u BiH bez obzira na njihovu vjersku i nacionalnu pripadnost i boju kože. To conclude, we feel the need to present ourselves as authors of these analyses of the situation in BiH (…). We are the sons of our father Mujo Hujdurović, whom during the Second World War the fascist rulers killed in the most horrible way (although he was a muslim) because, with us his children, he protected and defended from the fascist government neighbours from all of Semberia, Orthodox, Jews, and all others in danger; because he was one of the initiators of the Resolution of the Muslims of Bijeljina, Janja and Uglevik in December 1941, in which Muslims demanded the preservation of common life of citizens, and that the government (the croatian ustasha regime, which ruled over Semberia) protects all citizens; because he personally confronted the fascist government and performed a series of humanitarian gesture to rescue vulnerable citizens of all faiths. Guided by our father’s ideals and personal actions in the critical times of the second World War, we felt it was our duty to write this and give to the public and instruct the authorities, regardless of how they will appreciate it, in the hope that the parties in power will accept it, with the goal of responding to the problems of the poor in BiH, regardless of their religion and nationality and skin colour. “On the children will one day rely the double responsibility to both honor the dead by protecting them from oblivion and to overcome the legacy that burdens their families. It has been precisely that which the Hujdurovic brothers dedicated their lives to and continue to work towards, a better future for all. Notes: This text was prepared with full knowledge and in collaboration with Idris Hujdurović; back in 2008 the picture of the little girl was taken with full consent from her family; I sent the family paper copies of that and other pictures I took of them. This text was originally posted on Greater Surbiton, on 12 February 2014, and subsequently reproduced on Novinar.me. When I returned to Sarajevo in the end of January, after two years away, very little seemed to have changed, and I was struck by a dominant feeling of disenchantment, which became more clear when I asked people about the Bebolucija. Nobody wasted much time on their replies, merely expressing their disappointment. Thus, when, last Wednesday, 5 February, a friend in Tuzla posted on Facebook a few pictures she took of a protest, it looked just like another protest, as so many that have been staged over the years, of workers who lost their jobs or haven’t received their salaries, or farmers, pensioners, veterans… But this turned out not to be yet another protest, but that one moment when too much becomes too much. The police charged at the protesters, who were throwing eggs and stones against the building of the government of Tuzla Canton. My friend’s status on Facebook was “ja i moj narod vicemo…. Kijev u TZ” (“I and my people are shouting… Kiev in Tuzla”), translated very well the mood there, and people joined the protests the following days in growing numbers, defiant despite the use of force by the police; arrests; tear gas. The protests had turned violent, culminating on Friday 7 February in a local government building being set on fire, and prompting the resignation of the Prime-minister of Tuzla Canton. 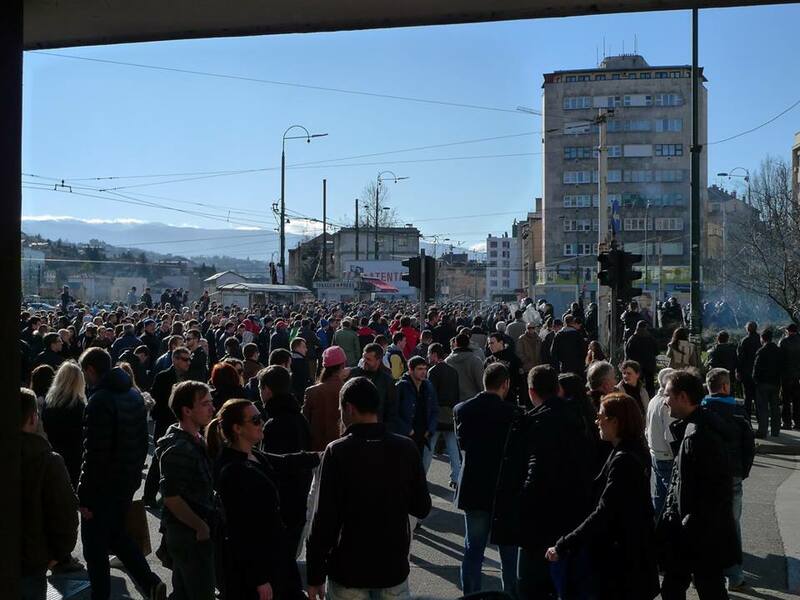 The situation is Tuzla immediately gave rise to protests in other Bosnian towns. I will now present my own eyewitness account of the protests in Sarajevo, which have been the focus of much anxiety, speculation, and manipulation. On Thursday 6 February, I found myself in a small protest in Skenderija, in front of the building of the government of Sarajevo Canton. I had been visiting the Ars Aevi collection depot, which had re-opened to the public that same day, and when I left and crossed the bridge towards the right bank of the Miljacka river, there they were, the protesters. The street (Obala Kulina Bana) was blocked, and riot police were standing in front of the government building, as well as the Dom Sindikata. Someone had used a banner saying ‘Niko ne sme da vas bije’ (‘No one is allowed to beat you’ -the phrase proffered by Slobodan Milosevic in 1987 in a meeting in Kosovo that marked the beginning of his ascent to power). The protesters were mostly youngsters as well as pensioners, and there were very few women, one of whom was standing on the road in front of the police cordon. It was objectively speaking a very small protest, maybe 200 people or slightly more, held in solidarity with Tuzla, as a protester informed me, but another protest was scheduled for the following day. When I left my home on Friday, 7 February to see the protest, I expected it to be more of the same as the day before – a few hundred people, kids and pensioners. And despite the example set by a much bigger mobilisation in Tuzla, when I got to Skenderija around 12 noon, I counted no more than a hundred people. There were a lot of police in riot gear, though, and there were obviously a number of them in civilian clothes as well. I went for a walk, and noticed that in the surrounding streets there were vans with more riot policemen, and quite a number outside the MUP (Ministry of the Interior) of Sarajevo Canton, including also vans typically used to arrest people. When I returned a few minutes past 1pm there were a lot more people, and within half an hour many more arrived, but still it was very far from a massive demonstration. The protest spread through the square in front on the building of Sarajevo Canton and the riverbank ahead, between the two bridges, with some people also watching on the two nearby bridges and from a safe distance on the other side of the river in Skenderija, and something like 50-100 people more spread through no more than 100 metres on the Obala Kulina Bana towards the centre. I cannot say how many people were there in total, but it was not a dense crowd, and there were lots of empty spaces, the crowd compact only in front of the building. The building was not protected by metal barriers as is usually seen elsewhere in Europe when protests occur, but merely by yellow tape with ‘Stop Police ‘ written on it. The police barrier was not compact either, merely a row of men, although there were more on the side streets. Traffic was diverted from that area, with the police blocking traffic in Marijin dvor towards the riverbank and in front of the Alipasina mosque. As for the protesters, there was an almost complete absence of flags and banners – only one older man with a big Bosnian flag and a few women with small banners, who soon left the protest. There were no chants either. Only ever now and then a few would should Tuzla Tuzla or lopovi (thieves). A man had a megaphone but the quality of the sound was so poor that 10 metres away as I was I could not hear any distinct words. Suddenly around 1.30-1.40pm a core of young protesters wearing hoods started throwing objects against the building, over the police, including stones and bricks. Cameramen and photographers ran for a safer position, but it took some minutes for the police to react, by advancing the barrier towards Kulina Bana (the riverside street). A middle-aged man started chanting the Internationale, but nobody followed him. At that moment I moved from the centre of the protest to the river bank (Obala Kulina Bana). That was when I could take a closer look at the hooded youths, who had also withdrawn from the garden to this area after the first wave of stone-throwing and the initial police reaction of advancing the cord some 10 metres. I could see how some of them communicated with small gestures, mere looks. One had a Molotov cocktail in his hand but after exchanging looks with another he hid it away. At that moment I made an assessment of the situation bearing in mind that I had previously seen a lot of police stationed in vans in surrounding streets. I was at that time next to the riverbank’s wall, between the stanica and the kiosk. Oddly, both kiosks were open for business. I realised that I would be trapped if the police charged (which I honestly assumed they would), so I decided to cross the river, expecting an escalation. Meanwhile the police threw some tear gas, but not in such a quantity to force the dispersal of the crowd. Already on the other side of the river, two kids aged about 16-18 were affected by the tear gas, and someone got bottles of water at the nearby kiosk to wash them. I didn’t stay long on the other side, and after crossing back I went to the balcony of the Dom sindikata, a building on this square, where people were watching. I was still on the Dom sindikata when, around 2pm, the police tried to disperse the crowd in two fronts, one on the riverbank next to the Dom, the second one by pushing the crowd towards the big bridge. An ambulance came as at least one policeman was injured. The watchers on the Dom sindikata showed some enthusiasm, but among journalists standing there there were more signs of concern. After initially being pushed back towards Kulina Bana and the bridge, the crowd charged back, and to everybody’s surprise, broke the police barrier, a barrier consisting of a single line with no rear back up. Then, instead of reassembling, the police withdrew towards the streets around the Presidential building, and left the Canton building totally unprotected. For a while I expected the police to come back, but they didn’t. Meanwhile the rioters seemed confused with such an easy victory. A few had to openly invite the crowd to attack the building. Eventually a small stand was set on fire, the window glasses were broken, and finally the building’s entrance was set on fire. All of this while the more passive protesters watched. There were also people standing on the street that goes from the bridge to the Alipasina mosque, but these were mostly just ordinary passers-by looking incredulous over what was going on. By 3pm I was still expecting a come-back from the police and did not believe at that moment that the destruction would spread to other buildings so easily as it did. I walked towards the building for a few shots, and that was when it became obvious that the rioters were becoming more aggressive. Two of them approached me and told me not to take photos of faces. They did so politely, and I did not feel in immediate danger, but other people with cameras were less fortunate and were punched or somewhat assaulted. It was 3.10pm when I took my last photo and decided to get back home. By then I had a headache which, I was told later, may have been the result of exposure to tear gas and fumes – I did feel very sick later that day. This was the protest, as I saw it. There were no banners, no demands, just a hundred young men or even less than that, who were given a chance to engage in destruction, maybe a hundred pensioners, and a few hundred people watching. I’ve been in many protests in different settings, and there was nothing of the typical protest vibe present in this one. There wasn’t even much anger, there was instead a rather odd, pervasive feeling that is hard to describe, as if it was some kind of parallel reality, and it was as if we were all feeling paralysed, merely waiting for something to happen – except the ones who were busy breaking glasses, spraying catchphrases and penises on the building’s walls and setting fire to the building. They didn’t show much emotion either, and certainly not rage. At that moment, they seemed guided only by a nihilistic sense of possibility. As I walked towards Marijin dvor, the absurdity of the whole situation dawned on me. Cafés, shops – including electronic goods shops – supermarkets and shopping centres were all open for business, as if nothing was going on, just a few dozen metres away. Except for the disruption in traffic, it was just another day in Sarajevo. Around 5pm things had significantly escalated and by then people had woken up to the seriousness of the situation. Rioters also attacked the Presidency building, setting it on fire, which damaged one of the deposits of the Arhiv BiH – the Bosnian state archive – located on the basement. The following is based on the eyewitness accountt of a friend, who lives in the centre, and was at the time of the events working in a building in front of the Alipasina mosque. When I called her around 6pm to know if she was safe, she told me, before the media reported it, that she could now see the building of the Opstina Centar – i.e. the municipal office – on fire. When we met on Saturday and went through the events again, she showed much more concern for the archives of the municipality than for anything else, as people’s practical issues are very affected: birth certificates, residency certificates, etc. She could understand attacking the Canton Sarajevo building and the Presidency, but not the municipality. She also told me that at 10pm, when he streets became secure again, and she walked home, there were many people in the streets, including people who took the tram to the centre with the specific purpose of taking a look at the destruction. People were walking up and down and there was a general feeling of sadness. I could see, and a number of people confirmed this to me, that this event brought back the memories of the first days of the war in Sarajevo, and the same emotions were felt all over again, like a tragic version of the episode of Proust’s madeleines. On Saturday I went to the centre in the afternoon. I strolled around, and it was very different than the normal Saturday afternoon. There was much less people out, I’d say a quarter of the usual number. There was no buzz, although all business were working as usual. I stayed until 8pm, and as there were no trams in the centre, I walked to Marijin dvor with my friend. In front of the presidency building was still standing a small group of people, maybe 20 – the remaining participants of a peaceful protest that has since taken place every day. On Sunday anther peaceful protest took place, in which I didn’t participate. The main demand was the release of the persons who had been arrested on Friday, and friends who joined described how they spontaneously joined, and how loosely organised it was, but it was clearly effective, as all the protesters were released between that evening and the following morning. I joined the protests again on Monday, 10 February, along with a friend. The atmosphere had radically changed. The Prime-Minister of Sarajevo Canton had meanwhile resigned his post, and there was a sense of possibility in the air, that positive change might be possible, although people I spoke to sounded very prudent, perhaps too modest in their ambitions, or perhaps realistically aware of the obstacles towards success. Trying now to analyse what I’ve witnessed, the big question for me (and for many others) was the police’s behaviour. It seemed clear from very early on that a decision had previously been made not to use violence, possibly in light of events in Tuzla. The police official reporting today (Wednesday 12 February) to the assembly of Sarajevo Canton confirmed that, saying that the lives of the citizens were more important than the integrity of the buildings. But this was not merely the case of police restraint. The police completely withdrew, leaving public and private property, including crucially the Presidency building, at the rioters’ mercy for a number of hours. My initial feeling was that power was crumbling like a house of cards, under the pressure of a few hundred protesters, but that was an illusory impression. The stakes are high for those in power, and they are not as detached as to let go so easily. There has since been much speculation about this, many rumours and conspiracy theories, some openly vented by politicians, such as was the case of Bakir Izetbegovic, the Bosniak member of the collective Presidency of Bosnia, who suggested the rioters came from Eastern Sarajevo, and SDA’s Ahmet Sadikovic, former Security Minister, who declared having information that the hooligans belonged to Slavija football club from Eastern Sarajevo, both trying to tap the ethnic key. Most importantly, there has been great anxiety over the possible role of the current state Security Minister, Fahrudin Radoncic, a populist politician who immediately tried to score points on the situation, and whom many are aware may, once elections are held, ultimately benefit the most from a situation of political unrest. But we can also question how willing would the policemen, even the special forces, be to use violence. This is a crucial question. Regarding speculation about who were the protesters and how well-organised they were: on Friday there was a certain level of coordination among the younger elements, and a core of people who were clearly organised. Some of them had an appearance consistent with the hooligan subculture, and I wouldn’t be surprised that they were fans of the local clubs, and homophobic graffiti sprayed on the Sarajevo Canton building makes one wonder whether some of them were the same people who attacked the cinema Kriterion where an LGBT festival was taking place. But these individuals were not the majority, and there were also many boys who seemed to have joined spontaneously, in small groups of friends. There weren’t many girls, but there were some, and there were a few people of all ages, but mostly people around 15-23, and older people, and very few people in their 30s. Disturbed as I may have been by their actions, in hindsight they seem to me rather mild. Private property was largely untouched and, bearing in mind they were let loose for a few hours, it could have been much worse. For instance, the GRAS kiosk adjacent to the tram stop in front of the Sarajevo Canton building was set on fire, and I suppose also pillaged. But the other kiosk, standing 3 metres away, was left untouched. In fact it remained working all the time I was there. As for whether these demonstrators were hooligans or not, that is a matter of qualification, and great efforts were made to seize upon the initial shock of the population to portray them in the darkest way possible. They were called ‘huligani’ (hooligans) and portrayed as drug addicts, and false news was published that the police seized 12 kilograms of speed in tablets. The media spin tapped into the socially dominant codes of behaviour, which divide people into ‘kulturni’ (cultured), ‘primitivci’ (primitives), ‘seljaci’ (peasants), etc., and this may have alienated a great number of people from the protesters. But the reaction to this spin was itself a form of manipulation, which denied the obvious. Of course there were hooligans in the protests, and they brought stones and Molotov cocktails. But over the years so many protests have taken place in Sarajevo, larger in number, with absolutely no results, and a few dozen ‘huligani’ with a few Molotov cocktails have set something in motion. At that moment, they seemed guided only by a nihilistic sense of possibility, but the fact remains that they did not merely break glass and burn government buildings and GRAS kiosks , but also broke the inertia that had previously seemed so overwhelming. Some people want to believe a revolution is taking place, but then again, only after everything changes can we say there was a revolution, and despite the resignation of four Canton governments (Tuzla, Sarajevo, Zenica and Bihac), power structures are still standing, largely untouched in fact, and a conservative reaction will very likely be supported by the international players, EU countries, neighbours Serbia and Croatia, and Turkey, which have their own unsolved domestic problems very similar to Bosnia’s, and which sanctify ‘stability’ more than anything else. They have anyway assigned Bosnia a low priority. Today the Catholic tradition has celebrated Saint Francis’ day. It was also Animal’s day. This was no coincidence. Francis of Assisi is the Patron Saint and protector of animals, and Animal is indeed than the secular version of the religious holiday that celebrates his life and legacy. Within the Western Christian tradition, Saint Francis was the first person to acknowledge in all living creatures, indeed in Nature itself God’s creation, not a gift from God to men, but creatures equal in dignity to the human kind, as is clear in one of his best known prayers, in which he called the Moon his sister and the Sun his brother. His contemplation of Nature was much more than a form of mysticism. As part of his call for a simpler life, he also preached kindness to animals and tried to teach his followers to overcome fear and prejudice and recognize animals as their companions rather than as their servants whom men are free to exploit. One of his most famous miracles was the domestication of a wild wolf, who had been attacking flocks and people around the town of Gubbio. Still, the message of Saint Francis went mostly unheard, and wolves remained in Europe one of the most vilified animals. Although wolves kept being seen as a threat and chased to the edge of extinction, no animal has been so mistreated within the Catholic tradition as the cat. Cats were seen as evil and identified in the popular tradition with dark forces and even with the devil itself, with black cats as a preferential target for cruelty. This attitude persists even nowadays among many people, mostly due to prejudice and lack of education about how best to deal with these sensible creatures who do not bow to a master and love their freedom more than anything else. Sadly, as it is well-known, the South of Europe has a particularly negative record in what regards mistreatment of animals, in particularly dogs and cats. But during my holiday in Dalmatia this Summer, I was able to observe how in the Island of Korcula cats receive the dignified treatment they deserve. The town of Korcula is full of cats, lingering around taking sun, indifferent to the tourists and displaying no sign of fear or distrust towards humans, but healthy and well-fed enough not to degrade themselves begging for food. This is the result of a old, well-preserved tradition going back to the Middle Ages, when Korcula was part of the Republic of Venice. The story of the cats of Korcula was told to me by an old man whom I randomly met while I was walking around the old town. He introduced me to his cats, whom readers can see on the photo. The yellow one is the son of the white cat with brown and black spots. There was also another one, a black one, from a previous litter. I met him yesterday, I told the old man, and showed him the photos I had taken of him. He told me then how the people of Korcula are grateful to the cats, whom the Venicians brought from the East to preserve the island from diseases propagated by rats. This is not a myth, he said, it is all written on the town’s historical records. For this reason every day the man feeds the town’s stray cats, as a sign of gratitude, as a duty he assumes. Through his love for the cats, it was also the memory of Korcula itself that is being expressed, and its historical identity preserved. 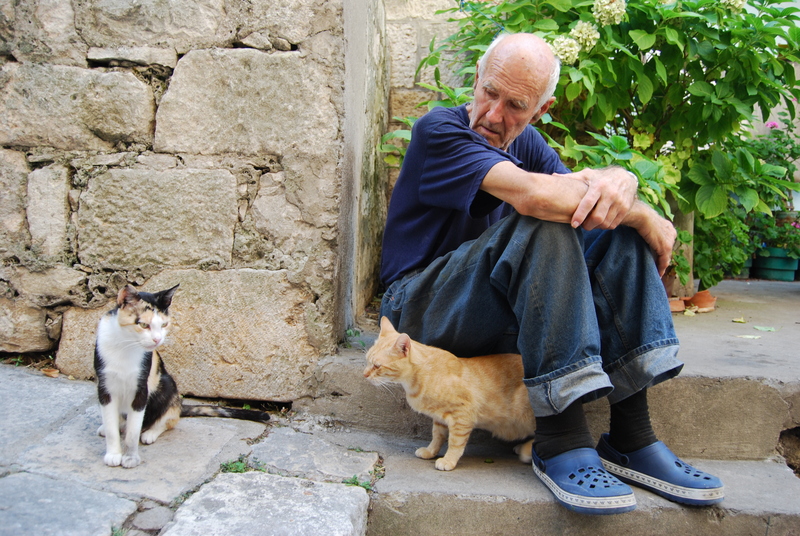 Korcula is known as an architectural pearl, plenty of beautiful medieval buildings and delicate masonry, and as the home town of Marco/Marko Polo, but it is the cats, and people like this man, who keep the character of Korcula and make it worth visiting and coming back to. This week the most important holiday of the Islamic calendar, Eid, which marks the end of the month of Ramadan, was celebrated. During Ramadan Sarajevo had a very particular atmosphere, pleasant in a different way. During the day the city was a bit quieter than usual. Many people were fasting, and other who didn’t, nevertheless restrained themselves from sitting in the cafés and restaurants. But as the night came it regained its buzz, as the Sarajevans went out to enjoy the cool Summer nights. Indeed, after a hot day, usually with temperatures above 30ºC, which makes fasting particularly challenging, in Sarajevo the night always comes as a liberation, as the fresh air from the mountains descends into the city. Many restaurants had special menus for Iftar, which compensated for the lower movement during lunch time, and in the streets ice cream parlours and vendors of grilled and boiled corn had more costumers than ever. Photo: Husreg begova dzamija, Sarajevo. There are many misunderstandings among non-Muslims in the West about the meaning and experience of fasting during Ramadan. 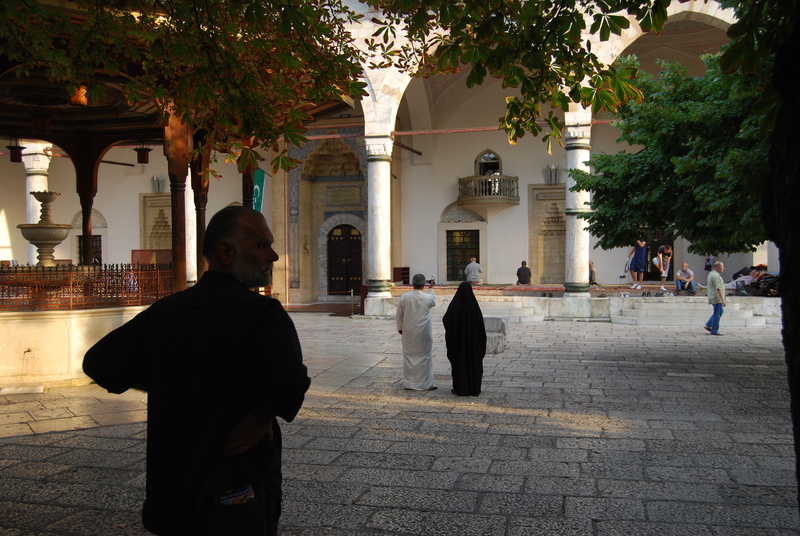 Many people believe it to be something equivalent to the Lent period for the Christians, while others consider that the Iftar meal, in which people break the fast, to be a proof of the hypocrisy of the Islamic values, as it is often believed that Muslims stuff themselves with food as soon as the sun disappears from the horizon, as if Iftar was some kind of potlatch (in the pejorative sense of the word). Both of these beliefs are ill-conceived. Fasting during Ramadan is above all an act of discipline, through which believers strengthen their will for submission to God, but it is not perceived by the Muslims as an act of sacrifice as we Christians conceive Lent. This is because while Islam focuses basically in self-discipline and acceptance of the community values, Christianity focuses on sacrifice and punishment, with the Catholics placing a particular emphasis on sin and repentance. So misunderstandings about Islam are not only a consequence of ignorance, but also of the fact that we tend to look at different cultures with the lenses of our own. As for the Iftar, it is a meal richer than a normal dinner, but anyone who has experienced spending a whole day without eating or drinking knows that one cannot stuff itself with food when the night comes, simply because the body cannot tolerate it. Iftar is the occasion to compensate the body from the daily fasting, and to prepare it to endure another day of fasting, but it is also an important social event. The whole day is in a way lived as an anticipation of these happy encounters in the evening, which reinforce the feeling of community. Families get together and friends are invited over, and the hosts make their best to honour their presence. As I spent part of Ramadan in Sarajevo, I had the opportunity to join some friends for Iftar. In this period, although I was not fasting, which would not make sense being myself a Christian, I realized soon that I should to eat as little as possible during the day, just a glass of milk and a slice of bread at breakfast, and some fruit at lunch time, to be in condition to adequately enjoy the experience of Iftar. Just like Ramadan isn’t Lent, so Bajram isn’t Christmas, although some similarities do exist. The first day of Bajram is celebrated especially among family, and relatives visit each other, paying tribute in particular to their older members. The sense of accomplishment for the fasting creates a particularly pleasant feeling, as people indulge themselves with their first morning coffee over one month. House wives prepare their best specialities, home made pita, traditional sweets like baklava, hurmasica, kadajf, etc. The second day of Bajram is dedicated to the Shehidi, the martirs, which in Bosnia makes particular sense bearing in mind the death toll of the last war. And the last day provides a final opportunity to celebrate with friends, before normal life resumes its course. Any religion is practised differently in different places by different peoples, and it is common to highlight that Islam in Bosnia has a very particular brand. That is truth, but it is an argument that places the emphasis on Bosnian Islam in a way gives the idea that there is a homogeneous way to live one’s religion. I remember how my old friend Emir criticized the title of Tone Bringa’s book “Being Muslim the Bosnian way”, stating that it was not the Bosnian way but the particular way of a particular village. In Sarajevo alone I’ve came across very different ways to be Muslim, and became particularly fascinated by the stories of religion sincretism that I heard from older women in the mahala of Vratnik, who over Iftar, upon knowing that I am a Catholic, told me that they used to visit the Catholic church of Sveti Ante, in Bistrik, and light candles there, a habit that they never felt to be in contradiction to their attachment to Islam. Such habits seem to have died out with the changes of generations, as nationalism increasingly came to influence the expression of religiosity, and the women spoke of those times with nostalgia for a Sarajevo that still exists, but mostly in their hearts. Still, the generosity of the Sarajevan Muslims keeps that old Sarajevo alive and allows us, outsiders, to get a glimpse of it when they invite us to share their celebration. This year I attended the annual commemoration of the Genocide in Srebrenica, in which 613 victims were laid to rest in their graves at the Cemetery in Potocari . It was the third time that I attended this commemoration (here my post on my first visit to Potocari). A few days earlier I joined the March of Peace (Mars mira), and walked for 100 kilometres alongside more than 6 thousand people in tribute to the victims of genocide in Bosnia. The path of the march, which was organised for the first time in 2006, coincides with the one taken in July 1995 by thousands of people who tried to escape certain death when the the enclave of Srebrenica was taken over by the army of Republika Srpska, by fleeing through the woods and then walking across the hills to reach free territory. Many died in this attempt. Those who survived started to arrive 6 days later at the village of Nezuk, the first settlement under control of the Army of the Republic of Bosnia-Herzegovina, and through which now passes the inter-entity line which divides Bosnia. The Peace March is done on the opposite direction, from Nezuk to Potocari, a symbolic return to Srebrenica. 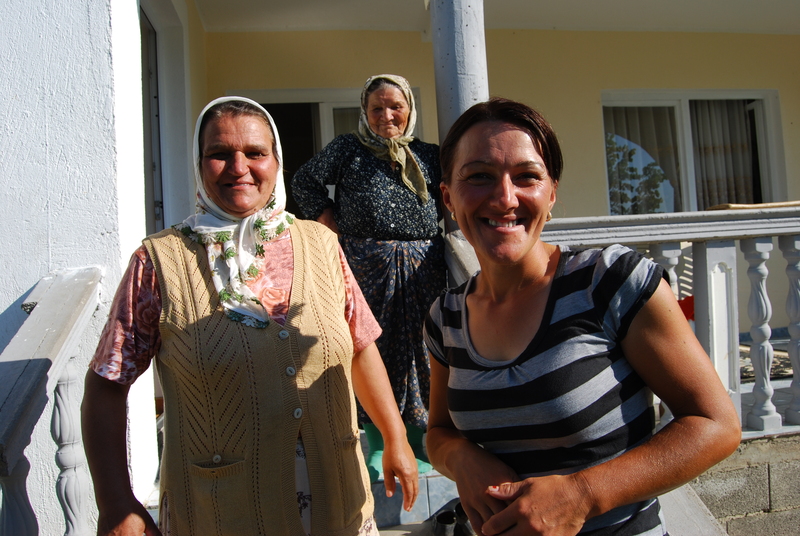 I arrived in Nezuk on the eve of the departure and stayed with a friend at the home of a local family. The warmth of their reception was moving.We were welcomed with hugs and kisses, although we hadn’t met before. Our hostess explained us the meaning of the march. She said it was a holy thing, like a pilgrimage, like the hadj. Her daughter, Elvira, then commented on how beautiful it is in the morning to see from the balcony of their house the column walking away, a column that extends itself for kilometres. The following morning I would be in that column. I’ve never been on a pilgrimage, but this did feel like one. The march was very demanding for the body and the mind of any healthy adult, but on the march there weren’t only healthy adults. There were plenty of small children as well, some as old as four, whom their parents carried on their shoulders or walked with hand in hand. There were also a lot of older people, and many many teenagers. This year’s march was particularly demanding because the temperature reached as much as 42ºC during the day, more when we walked on asphalt, the organisation had not enough funds to provide some food, and there weren’t many places to get water. Many were poorly prepared, had no appropriate shoes, carried bags that were too heavy, not enough water. But nobody complained and their effort was no more for them than a call for modesty, a reminder that this was not even remotely comparable to what those who took part on the original march had to endure. This was for everyone a personal challenge, but our will was strengthened by the warmth of the Bosniak population along the way. Clearly for them this was a major event, one which reminded them that they, so called minority returnees, were not alone. The villagers prepared coffee for the marchers, gave us fresh water, invited us to take some rest in their gardens. Few things impressed me as much as the dignity and the courage of these people. Going through the mountains and the hills in a region that is now part of Republika Srpska, I had the opportunity both to observe the level of destruction during the war and the level of return of the Bosniak population. All the houses belonging to non-Serbs had been systematically destroyed, not a single house was spared. Those who returned had to build them again, and live with the sense of uncertainty about their own security. Among the returnees there were many young couples, and many many children. This contradicted the dominant perception, which I also shared, that returnees are mostly older people, who benefit from state pensions. That may be the case elsewhere, but it is certainly not in the villages in those hills. Why did so many people return ? There are many reasons, but as my friend Peter Lippman, who has been since the end of the war a very close observer of the return movement, once told me, deep love and attachment for their piece of land is one of the most important. The beauty of this region is overwhelming, and as the evening came and liberated me from the oppressive heat and sun, I could enjoy the sun setting behind the mountains far away and the night slowly falling until the sky became totally dark and the stars appeared in its full splendour, no city lights anywhere near, and feel fortunate to be there. The environment among the participants on the march was largely positive. There were many young people, many teenage boys, who behaved as is proper to their age. They laughed, made jokes and played tricks on their friends, and that contributed to a lighter environment. But they kept on their mind what was the purpose of this trip. A young man joined the march because his father in 1995 didn’t make it. Who could judge what was the motivation of each one of them? In this country almost everybody has a story to tell about the war, but not all feel the need to share it. “Where are you from?”, I asked a group of girls who were resting by my side under the shade. One of them said “we were born in Srebrenica but live in Zivinice.” Teenage girls born in Srebrenica, there was nothing more to ask, anyone can do the maths. “We need more girls on the March”, I said. “I agree” she replied proudly, and then her group got up and started walking. There were, of course, problems among the crowd. Alcohol was forbidden and there was as strict set of rules to follow, but it was not easy to make people fully comply. Many were as irresponsible as getting to the woods in heavily mined areas; some behaved in a less respectful way towards the female participants, flirting a bit around; a lot of people abandoned their rubbish and empty bottles of water along the way. But the biggest problem was the attempt of subversion of the peaceful environment by a small (no more than 100 people) but very loud group of people who, displaying Islamic flags, shouted ‘Allah Akbar’ every time they passed trough Serb policemen and even louder when then knew they were passing through areas inhabited by Serbs. Most of them were Turks, members of the Turkish Humanitarian Aid Foundation (IHH), the Islamic fundamentalist organisation that behind the Gaza flotilla last year. It is deplorable that genocide in Bosnia is abused in such a way. Such attitude only reinforces the mental barriers against coexistence among different nationalities. And unpleasant as it may be for a Serb peasant or an RS policemant to hear this, this hurts above all the Bosniak minority returnees. I could observe how upset those returnees who participated on the march, some of them survivors from 1995, were. I asked a few about this, and they all were angry that these trouble makers, who lived either abroad or in the Federation, Bosnia’s other ‘entity’, came to this region only to reinforce the negative stereotypes about Muslims and Islam and thus the mental barriers against coexistence among different nationalities in Bosnia. The third day was full of emotions. The march passed through mainly Serb-inhabited areas, through many mass graves. Around noon, the march was halted, and my friend and I walked up a hill to eat and get some rest at the shade. When we came back to the road most of the participants had already departed. By coincidence, one of our friends, who had hosted us in his house the night before, was just passing. “That hill”, he said, “was where the Serbs attacked the column which then split into two”. He made a pause, then said, “in an instant, a thousand people were dead”. It took our friend 62 days to reach free territory. The mood was quieter on the third day, as if we were all mentally preparing ourselves for the commemoration we were to attend the following day. But in the afternoon, when our sight reached our destination, Potocari, for a moment we all felt proud, and happy, and the heat and the thirst and everything else was quickly forgotten, and people congratulated each other for having got there. In the matter of three days, a community had been forged, the community of those who did the march. Like a pilgrimage. In Potocari, I joined a local friend, who gave us shelter for that night. When she presented me to two of her friends and said that we had just done the march, one of them said she was on that same march in 1995. “I made it through”, she said. Then a pause. “But my husband didn’t”. Silence fell for a moment and only then it really came to us what it was all about, and why it was important, this pilgrimage. She couldn’t remember the place where her column was attacked. We guessed it was the same place where we had had our nice nap a few hours earlier, but we didn’t dare say it. “I will ask those policemen”, she said, and so she did. They looked at her with surprised and asked “Where are you from?”. Serbia, she replied. There is no place like Bosnia and Herzegovina to shatter all our certainties. 6 of April: Remembering war in Sarajevo. This week two historical dates were commemorated in Sarajevo: the day of the liberation of the city in the Second World War and the beginning of the siege of Sarajevo, in 1992. 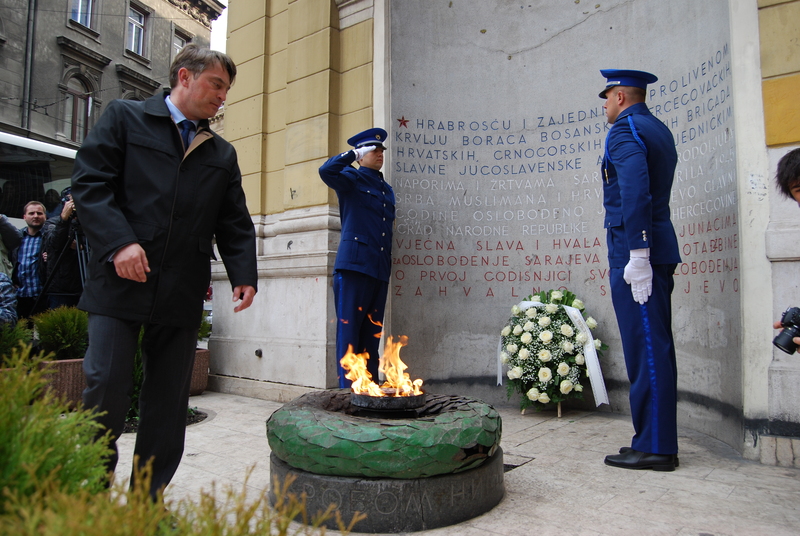 Photo: the Croat representative on the collective Bosnian presidency, Zeljko Komsic, places a wreath of the Eternal Flame. 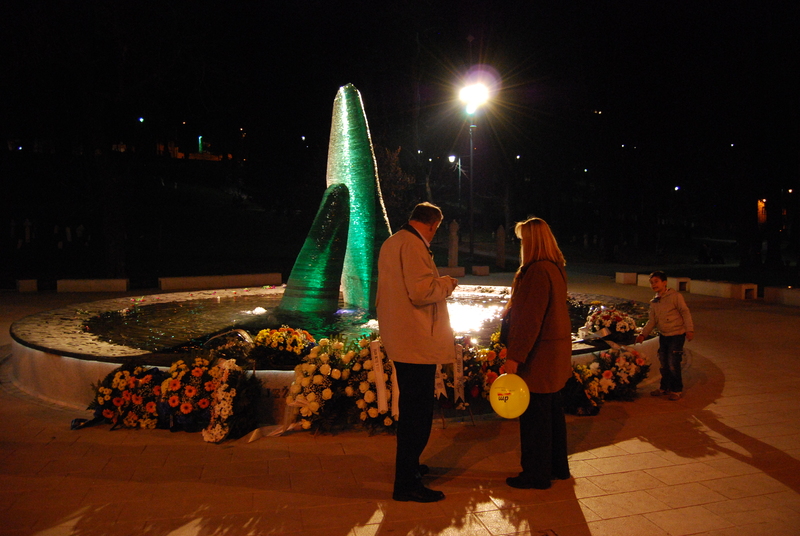 The commemorations started with the deposition of flowers in memorial monuments. 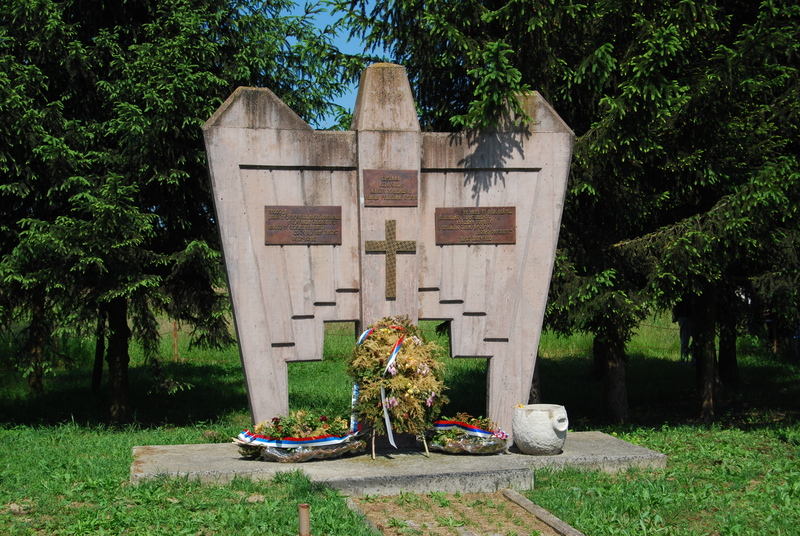 Flower wreaths were placed in the Eternal Flame, which marks the victory over fascism in the Second World War, but also at the Cemetery of Kovaci, the mezarja (Muslim cemetery) dedicated to the Shehid, the fallen soldiers of Muslim faith. Flowers were also placed at the statue of Tito at the University campus (where the JNA barracks used to be), and at the bust of Vladimir Peric “Valter”,a partisan who became a mythical figure in Sarajevo; at the Vrbanja bridge in Grbavica where on the 6 of April 1992 two young women, Suada Dilberovic and Olga Sucic, were killed when Serb forces started shooting at a peace demonstation- the bridge was renamed after them; at the Partisan memorial park of Vraca; at the Old Jewish cemetery; and at the monument dedicated to the children of Sarajevo who were killed during the siege. The commemoration of both wars was simultaneous not only because of the coincidence of dates, but also because of the coincidence of places: both the memorial park of Vraca and the Jewish Cemetery were used as launching pads from which the Serb forces targeted the city. The connection between both wars is also made through the invocation of anti-fascism. Such approach, while establishing a connection between both wars, also allows to identify the nature of the recent war as a new episode of the confrontation between fascism and anti-fascism, and thus ‘de-ethnicise it’. But such connection is far from being consensual, and reflects the ideological divide existent in Bosnian society. Not everyone views the communist regime only through the perspective of an heroic anti-fascist struggle. Thus not everyone who went to the Mezarija in Kovaci went also to the Vijecna Vatra, and only people affiliated with SDP, the social democratic party, went to Tito and Valter’s statues. Only a few people attend such institutional ceremonies, mostly people in official positions and NGO activists. Most Sarajevans are rather indifferent to them, and simply spend this city holiday enjoying Spring. This does not mean that they are unaware to the meaning of such date. On the contrary. We are speaking about living memory here. Those that are old enough have their own war experience to cope with, including, for the elderly population, the memory of both wars, and for the younger ones the legacy war is present both through their family’s history and through the lack of perspectives towards the future, a consequence of the social and political environment that emerged out of the war. Photo: the memorial dedicated to the children of Sarajevo killed during the war. 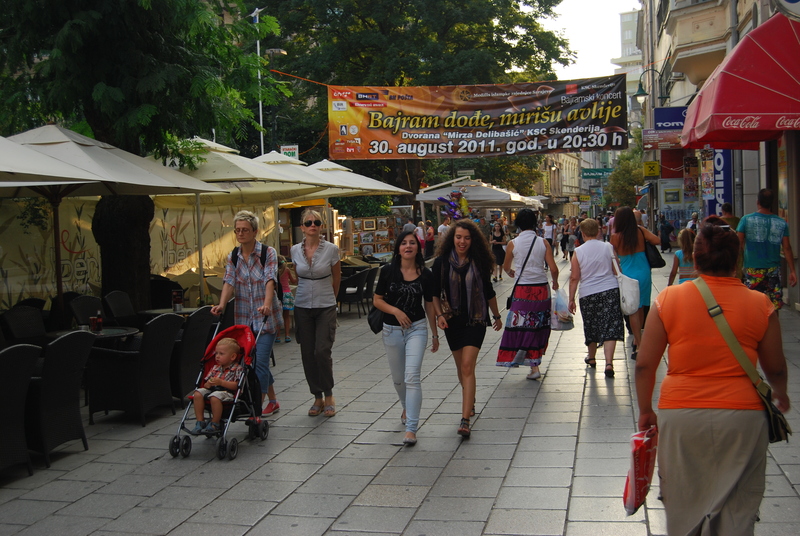 This larger mass of people, who does not actively participates in commemorations are nevertheless interpellated by the existence of the memorials on the public space, on the streets which they walk through, on the squares where they enjoy their coffee or their beer, and the flowers remind them that there is something to commemorate. This is why different political forces try to place their own imprint into these memorial sites, so that they become associated with what is there to be commemorated and through that memory assert their legitimacy. But there is more to memory than politics, and that is why, of all the forms to commemorate the war that took place in Sarajevo on this 6 of April, the one that most challenging was an anonymous initiative: on the Ferhadija street, formerly Vasa Miskin’s street, on the exact place where in 27 May 1992 the bomb that killed 20 people hit the floor, in what became known as the bread line massacre, someone drew a square with tape, and painted it orange, and on the centre, where the impact hole is, a red rose was placed. I sat on some door steps for a while, watching people’s reactions. Some walked through without even noticing, but most people tried to avoid stepping over it as much as they could, contorting it when they could, or bouncing sideways to in extremis avoid smashing the flower. This is the most crowded street of Sarajevo, and it was not easy to see it before getting to its spot. Some people stopped and looked at the memorial plaque placed at the wall of the closest building, others did not stop, but through their face expressions and gestures acknowledged the meaning of this rather precarious, ephemeral. Like memory, and like life itself.